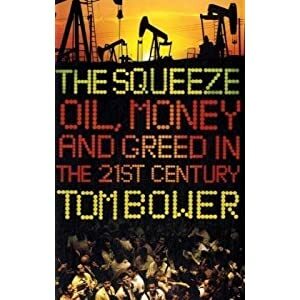 Over the summer, I really savoured reading Tom Bower’s book, OIL – Money, Politics, and Power in the 21st Century which – covering 1990-2009 – has become the unofficial sequel to Daniel Yergin’s The Prize: The Epic Quest for Oil, Money, and Power – covering the 1850s to 1990. Shell prospered but was often beset by Anglo-Dutch internal squabbles and having rings run round it by Oligarchs, Greenpeace etc. For all that, compared to preceeding years, oil prices have now gone through a year of relatively high stability, largely in the $65-$80 range which makes me think it won’t last. I looked at this chart (CNY:USD 5 years) and this seems to be true. The roughly 16% gain in the Yuan over the last 5 years against the dollar is quite well correlated to the jump in oil prices that we had over that period. So maybe we now have a clearer idea with recent history in mind of what can cause oil prices to go up again? The bottom line is that the USA has had all the benefits of having the global currency – cheap credit, low transaction costs and enormous diplomatic leverage for too long to now turn round and demand China revalues their own which will cost the Chinese and the USA dearly if not managed gradually. And should such a dispute kick off, all sorts of unintended consequences like higher oil prices will hurt the rest of us. I really hope America’s politicians pull back from the brink on this one. Because as I wrote back in Spring 2007 for World Finance magazine, The nightmare of a Chinese economic collapse, the consequences could be very ugly. China – Currency Manipulating Protectionists or President Obama’s scapegoat? An excellent, absolutely must-read piece in this weekend’s Wall Street Journal – The Yuan Scapegoat – and a timely rejoinder to calls for China to orchestrate a revaluation of the Yuan so that all will be well with global imbalances, US trade deficit etc. To put it very simply, one half did the saving and the other half did the spending. Comparing net national savings as a proportion of gross national income, American savings declined from above 5 per cent in the mid 1990s to virtually zero by 2005, while Chinese savings surged from below 30 per cent to nearly 45 per cent. This divergence in saving allowed a tremendous explosion of debt in the United States because one effect of what Ben Bernanke, chairman of the US Federal Reserve, called the Asian “savings glut” was to make it very much cheaper for households to borrow money – and to a lesser extent for the government to borrow money – than would otherwise have been the case. Back to the WSJ piece. Ok, so China pegs its Yuan to the dollar at about 6.83 and if it was floating, it would be worth a lot more because of the US recession and continued growth in China. However, the point is that currency pegs are not just about mercantilism – far from it. They are also about exchange rate stability and stable monetary policy. Those were after all the two main reasons for the creation of the Euro (thank God we never joined it!) and all the legion currency pegs that have existed in the past and continue to exist today. The WSJ leader adds that “China is right to resist calls for devaluation, not least because a large revaluation could damage growth. China has learned from the experience of Japan, which bowed to similar US currency pressure in the 1980s and 1990s” which as we all know was followed by a prolonged bout of deflation and near zero growth. Less observed though is that Japan continued to run a trade surplus, as imports fell with slower internal growth and cross-border prices adjusted. Whilst conceding that the current situation is not ideal, a far better solution to the revaluation says the WSJ would be to address the shortcomings of the yuan’s development as a tradable currency and disintermediate China’s central bank who keeps buying US T-Bills or Fannie Mae Securities which it calls a huge misallocation of global resources. What the Chinese could do would be to make the yuan convertible (+ a small one-time revaluation to 6.5), and let capital and trade flows adjust through private markets rather than the Chinese Central Bank. All of which sounds pretty sensible to me. “Let us briefly consider what would happen if Professor Krugman got his way and there was either a 25 per cent devaluation of the dollar against the renminbi or 25 per cent import duties. Almost overnight China would sink into a deep recession as exporters already operating on wafer-thin margins were plunged into insolvency“. A Chinese recession really matters a lot because as I wrote in Spring 2007 (the May 2008 date shown is incorrect) for World Finance Magazine – The Nightmare of a Chinese Economic Collapse – the country could quite literally implode into a morass of ethnic tensions and profound rural unrest and may even try to maintain unity by lashing out at Taiwan, which America is pledged to defend. When you start a trade war, you just don’t know where it’s going to end. No doubt, some genius at the European Commission is already thinking about how to implement a 30% import tariff on US goods because the Euro is seriouly over-valued against the US Dollar. Now back to the real world. Can I just say that I for one, have been very impressed with my Chinese printers – who are cheaper, better, keener and almost as fast thanks to air freight as my local ones. No wonder the price of paper pulp has shot up since last year because of Chinese demand . . .